Four future AFL stars under one roof!? In the Selwood house, there's madness and mayhem every day - and footy, of course! 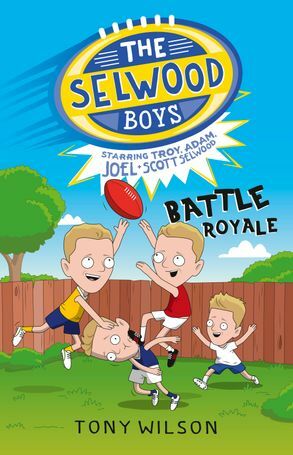 Meet the Selwood boys ... There's the twins, Troy and Adam, pulling pranks and making mischief, then Joel with his sneaky, cheeky antics, and finally little Scott, who just does his best (or make that his worst!) to keep up. Can Joel finally get off the sidelines and onto the footy field to play with his big brothers? It'll be a battle royale that's bound to involve the whole family! Tony Wilson is a much-loved Australian children's book author and one-time Hawthorn draftee. His books include Harry Highpants, The Princess and the Packet of Frozen Peas, Stuff Happens: Jack, Emo the Emu and The Cow Tripped Over the Moon, which was an Honour Book in the 2016 Children's Book Council of Australia Awards. Tony lives in Melbourne. The Selwood brothers are four of the AFL's favourite sons. Troy Selwood played for the Brisbane Lions from 2005 to 2010 and his twin brother, Adam Selwood, was a Premiership player for the West Coast Eagles. Joel Selwood is a three-time Premiership player, five-time All-Australian, four-time AFLPA Most Courageous Player and the current captain of the Geelong Cats. Youngest brother, Scott Selwood, was vice-captain of the West Coast Eagles and their 2012 Best and Fairest, before joining Joel at Geelong in 2016.